Inspired by Goethe. Lieder by women composers of the 18. And 19. Centuries. Composed by Ann Willison Lemke. Voice and Piano (Basso Continuo). First edition (teilweise/partial). Vocal Music. Full score. Composed 1999. Duration ca. 64'. Published by Furore Verlag (FV.FUE-6300). ISBN M-50012-630-0. Text: Johann Wolfgang von Goethe. 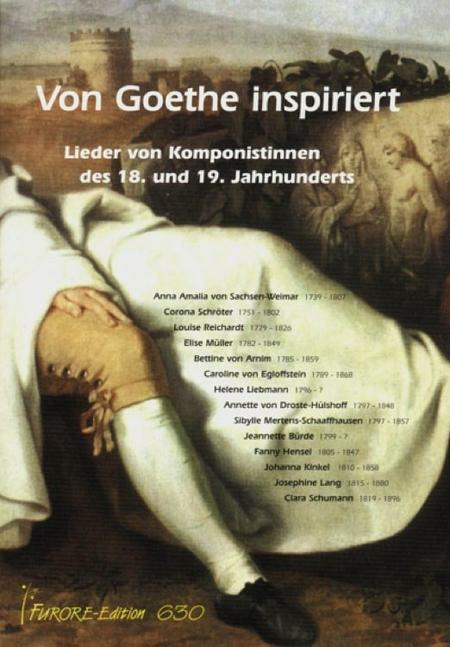 Titled "Von Goethe inspiriert," Furore Verlag presents a collection of Lieder by women composers on poems by Johann Wolfgang von Goethe. It witnesses the great presence of Goethe in the lives of many of his contemporaries. Chosen were composers whose dates of life cross Goethe's lifetime some time between late18th and 19th century. In many individual ways reverence is given: young Bettine Brentano is enthusiastic, Fanny Hensel, Clara Schumann and Josephine Lang create Lieder of outstanding musical quality, Johanna Kinkel offers freshness and spontaneity. A fine and modest attitude is characteristic for Louise Reichardts and Annette von Droste-Hulshoff's songs. The Weimar circle is represented by the Duchess Anna Amalia of Sachsen Weimar and Corona Schroter who contribute Singspiel songs. Several names one may not have heard before and be astonished about the fine quality of Lieder by Helene Liebmann and Jeannette Buerde. The volume is edited by Ann Willison Lemke, (PhD musicology and literature) It includes several first publications. Well suited for instruction. Level of difficulty: easy to medium. Preview: Inspired by Goethe. Lieder by women composers of the 18. And 19. Centuries.